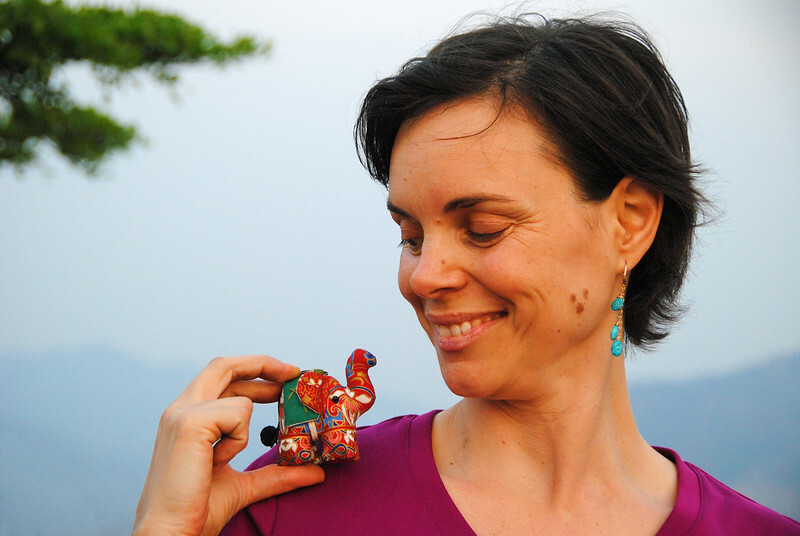 After almost 4 months hibernating in Chiang Mai, we are finally packing up and heading out to explore. It's the longest period that we've stayed stationary in any one place and in hindsight it was absolutely necessary after almost calling the trip off due to extreme travel fatigue when we were in Finland last summer. It's been an amazing break - got a lot of rest, did some of our favorite hobbies (yoga and hiking for Neda, sleeping and doing nothing for me), made some friends, found new favorite restaurants. It's funny, we weren't even planning on coming to Thailand. Originally we were eyeing Greece as a place to spend the winter. And now we're making plans to settle down here. Crazy! But that's for later. Right now the travel bug has bitten again. Once again, we find ourselves staring at maps online, zooming in to all the little squiggly lines that zig and zag through mountains, across geo-political borders, dreaming of where they'll take us and what those places will look like. 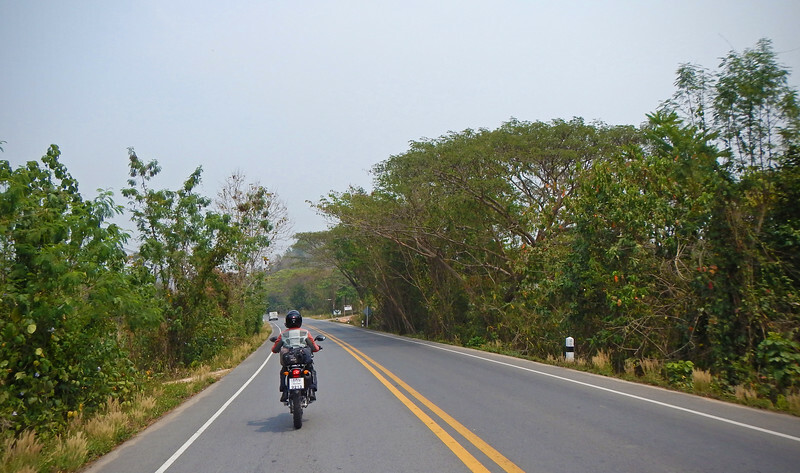 We're armed with motorcycles and we've just completed our sighting lap around Northern Thailand. Revs are up and the red lights go out! 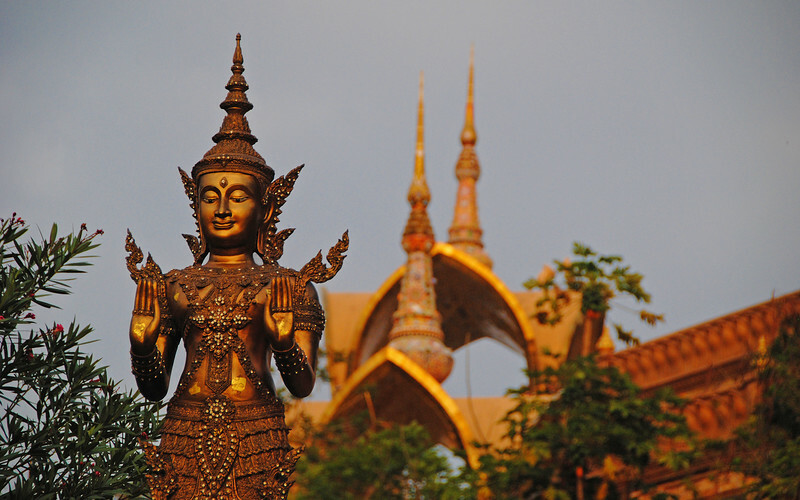 With everything we own in Asia strapped down behind us, we head off to explore Thailand. Bye bye, FutureHome! We'll be back again! 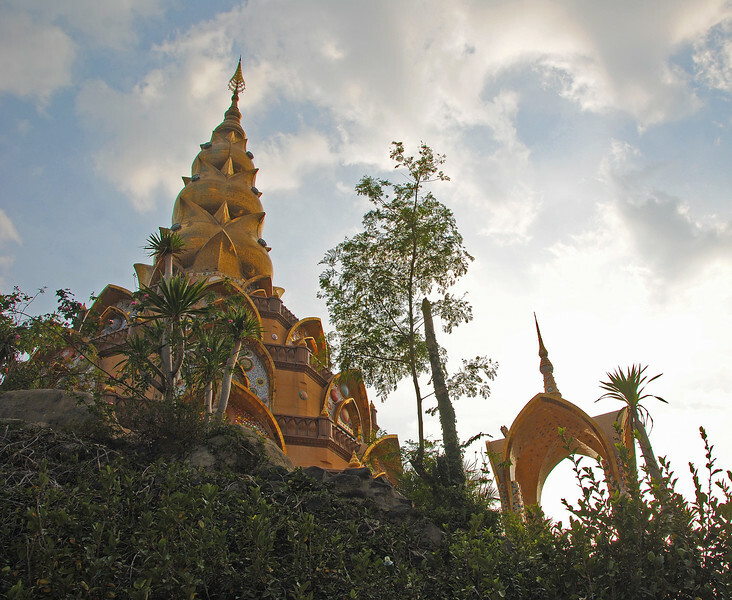 Getting out of the urban sprawl of Chiang Mai takes a while. It's a fairly large city, and the main highway south-east passes through many smaller suburbs and communities. The scenery doesn't get interesting until the road hits the Doi Khun Tan national park and we're back into mountainous territory again. The two of us have been taking turns doing the planning while in Thailand. 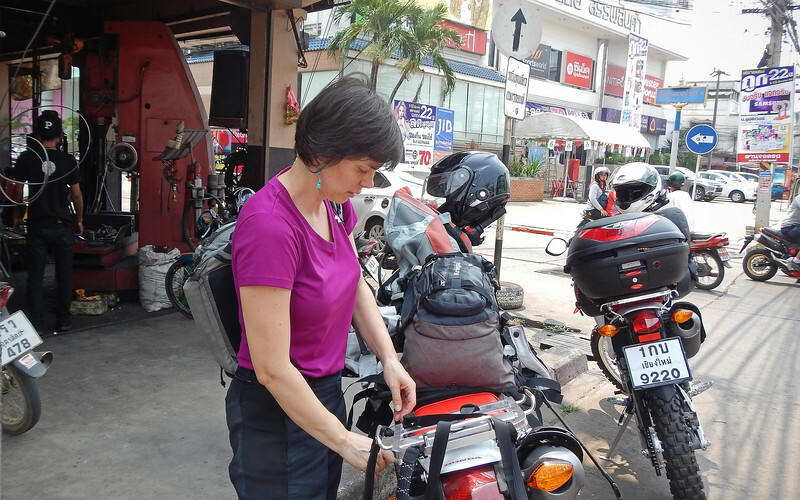 Neda organized our Visa Run into Laos, then I did all the research for buying the bikes here. 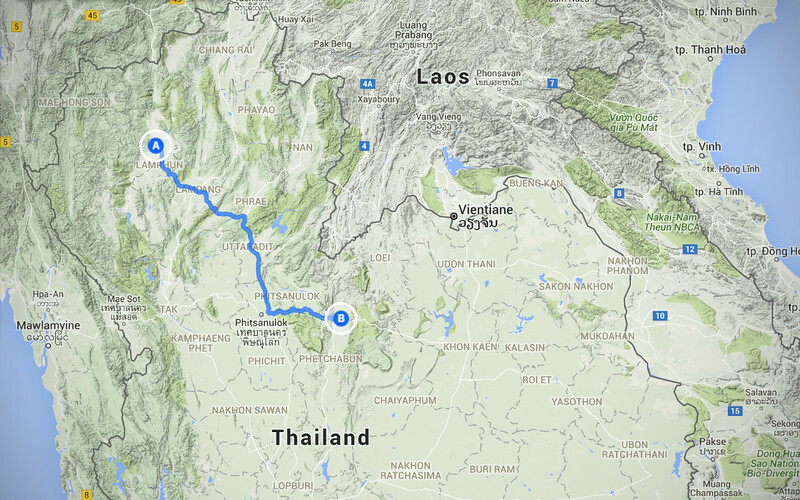 Our Mae Hong Son route was planned by Neda and now I've taken up the reins again as we head south into the country. I've looked back into how we divide up these duties, and often it's the person who speaks the language that takes over by default: Neda did Latin America, Italy and all the Slavic countries. I did North America, France and Morocco. But here in Thailand, we're both equally at a loss with communications, so it's been more egalitarian. 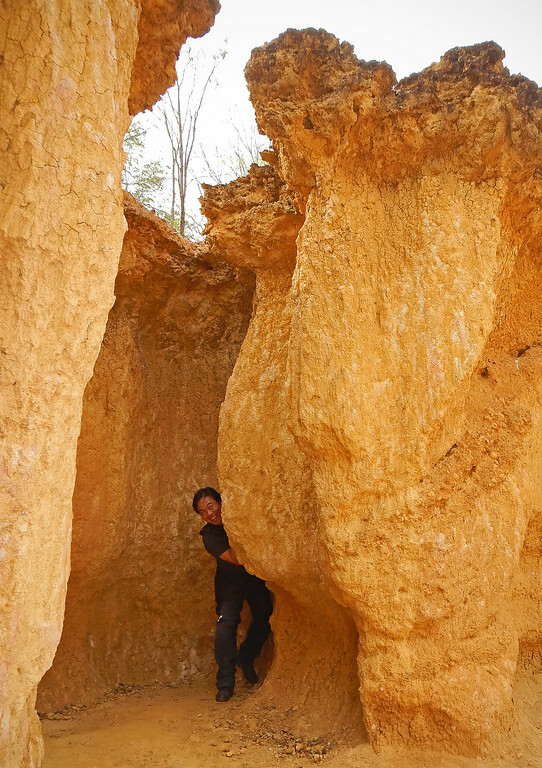 I found the Phae Muang Phee Canyon while looking for a route southbound. 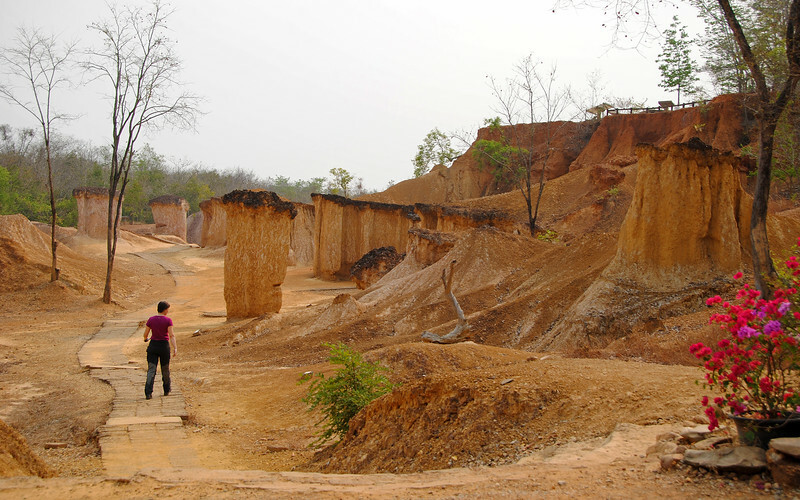 The sandstone here has been eroded over time to form phantasmagorical shapes. 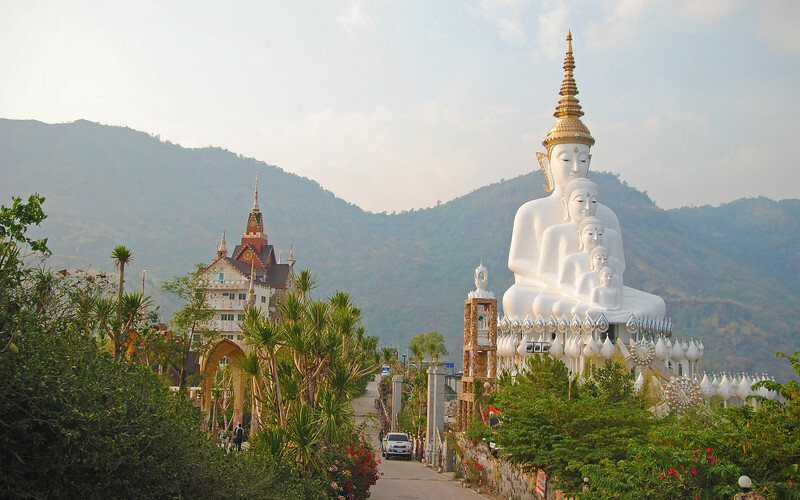 Legend has it that this place is haunted, as the "Muang Phee" means City of Ghosts. Creepy! As we've discovered in Thai, the "h" in "Ph" is silent, so it's pronounced Muang Pee. Phee-king out from behind the rocks. The red rocks and mushroom capped formations really reminded me of the Tatacoa Desert in Colombia. 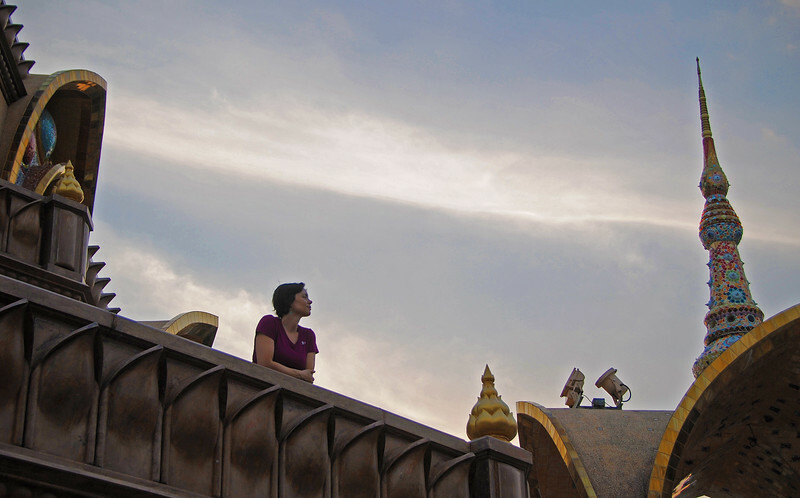 Funny how the more we travel, the more we see the same things in various parts of the world. Not just in geography, but certain similarities in the people and their cultures as well. 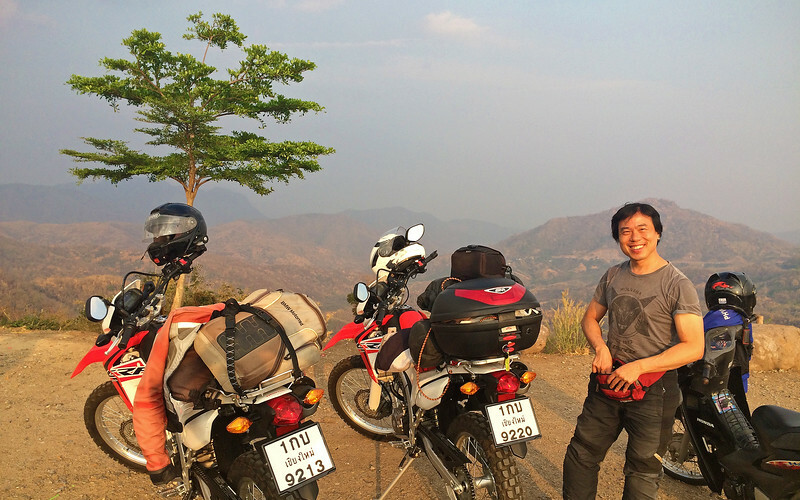 After Muang Phee Canyon, we hop on our bikes and take a slow, lazy ride to our stop for the evening - another large city called Uttaradit. Total mileage for the day - 230kms. 555! Despite having AirHawk inflatable cushions, the seats on the CRFs are so hard, I don't think we can do any more mileage than that without suffering. We don't get up too late the next day - around 8AM. But by the time we grab some breakfast and pack the bikes, it's pushing 10AM. 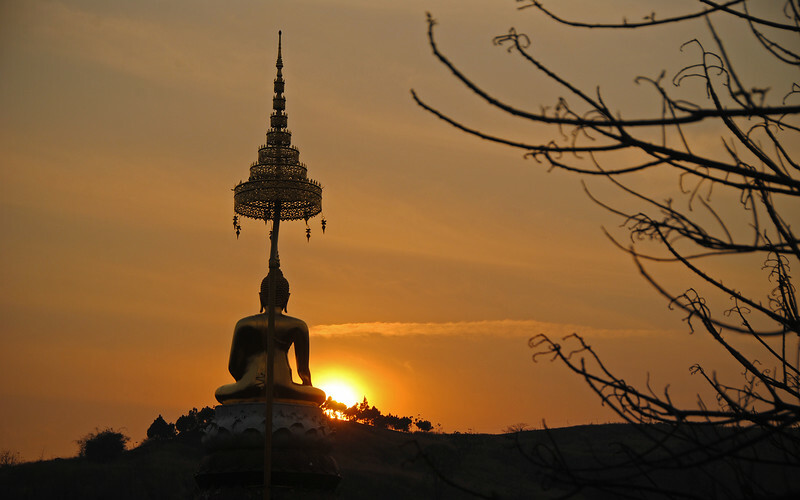 The sun is beating relentlessly down on us in a way that we never felt up in the mountains around Chiang Mai. We're in the lowlands now and I have a feeling that as we head further south, we're going to experience the same kind of oppressive temperatures we felt when we first touched down in Bangkok. 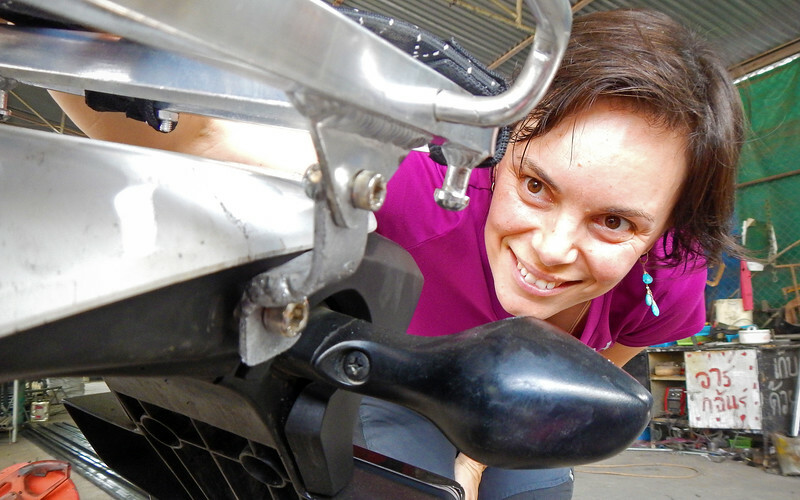 As Neda was packing up her bike, she noticed the rack was a bit loose. Uh oh. That doesn't look good. And now one of the braces that supported the rack on the subframe has just snapped. 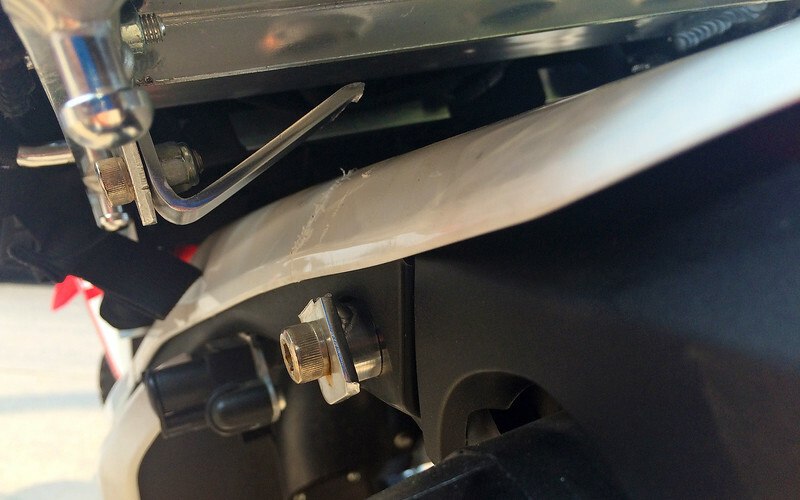 And the other side was missing yet another nut, so the rack was basically flapping up and down, hitting the tail of the bike. It's not wise to continue without getting this fixed. The rack will vibrate itself off the bike if left in this state. The problem is that we don't know where to get it repaired and nobody out here speaks any English. Did I mention it is absolutely stinkin' hot outside? So all these Honda stores which are plentiful all over Thailand will be of no help on this trip. Good to know. Next we try generic motorcycle/scooter stores. There's one strategically placed every 200m down the main strip and we hop on and off the bikes in the searing heat. At each place, we knock on the door, point at the broken part, and receive a shake of a head and shrug for our troubles - no luck. The CRF rack is a pretty specific part. In the picture above, we just came out of a machining shop thinking they could make us a part but they also just shook their heads when we pointed at the broken rack strut. At least I buy a few extra nuts from them and fix one side of Neda's rack so it doesn't free-swing up and down anymore. Sweat is dripping down my nose as I simply screw the nut on the bare bolt. It's so hot and we've been wandering around for over an hour. What are we going to do? Where do we go to get this thing fixed?!? It looks like they are manufacturing those caps which convert flat-bed pick-up trucks into Song Thaew buses. After exiting the machining place, I didn't have high hopes, but Neda dutifully trudged across the street to "talk" (sign language) to them anyway. I went off to buy some water at the 7-11 next door (seriously, urban Thailand is basically wall-to-wall 7-11s and Honda dealerships) so we don't get dehydrated doing all this footwork. 15 minutes later she comes out with a grin. They'll take a look at it! Awesome! We wheel Neda's bike into the back of the shop and strip the bags off of it. The lady below is the person Neda was talking to and she speaks a little bit of English. There are about a dozen guys in the shop and they're all working on creating the shells of the caps that fit on back of the trucks. There are hundreds of them piled up on the sides. They must supply the whole country. This was a pretty big operation. But they still found time to look at our broken rack. One of them told the lady because it was aluminum, they couldn't weld or repair it. He took a piece of scrap iron lying on the floor, cut a small piece off of it and compared it to the snapped strut. They were going to fabricate a new piece from scratch! Cool! And then in the back of my head, I thought... How much is *that* going to cost...?!?! I don't ask. This needs to get done and we don't have any other choice... How expensive can it be? We're in Thailand, right? At one point, there were three different guys working on our tiny rack strut. 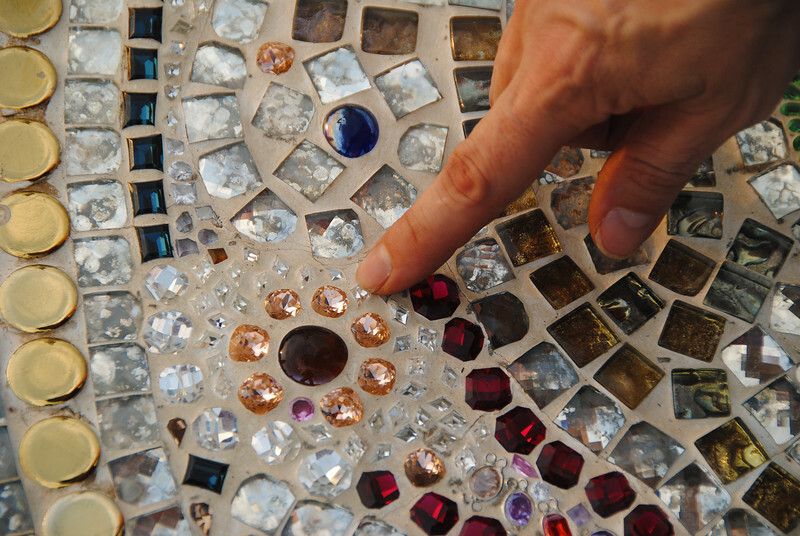 One guy was using a blow torch to shape the piece. This guy above was smoothing it out. And then the main guy kneeling at our bike above was in charge of making sure it fit. They seemed happy for the distraction from their everyday process. At several points, the other guys in the shop came over and looked at the work and our bikes with curiousity. 45 minutes later and Ta-dah! They even painted the new part! Made of iron, if we ever ride through a nuclear explosion, this will be only piece on the bike that will survive intact. The lady that we talked to handed Neda an official invoice for the work. I gulped as I looked over Neda's shoulder. 150 baht. Which is $4 USD. Holy crap! That's awesome! I love Thailand! We chatted a bit with the lady as we loaded the bike and stress-tested the rack. Everything looks great and we wave to everyone at the shop and head out to continue our trip. I know this wasn't a big issue, but finding solutions to a problem when you're in a foreign place and don't speak the language is such a satisfying experience! 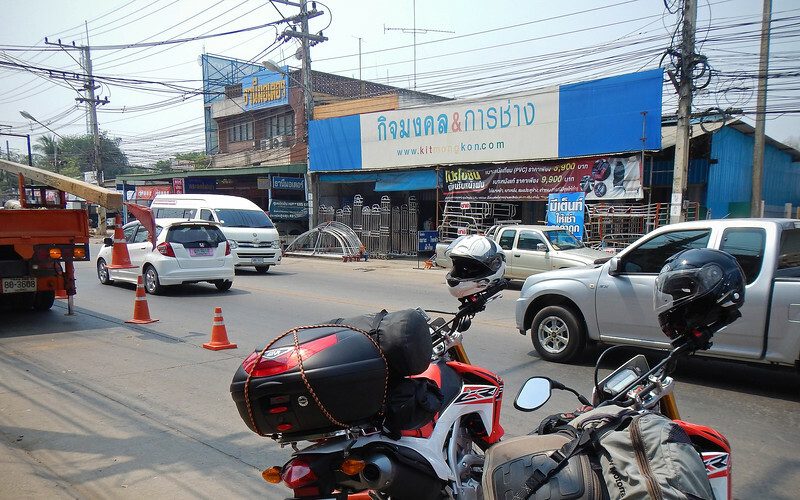 We've been delayed a few hours in Uttaradit trying to fix Neda's bike, so we headed straight south on boring urban highways until we hit the Thung Salaeng Luang National Park where we turn eastwards. So far our ride has gone like this: city, town, city... park. City, town... park... The road skirts the northern edge of the National Park and the buildings and people taper off, replaced by small, forested mountains and the lonely winding roads that accompany it. We had another small drama when we almost ran out of fuel because there aren't any gas stations in the park. We're totally not used to the minuscule range that the CRF's 7.7L tanks offer up. We hit reserve around 190kms with no fuel pumps in sight. Over the radio, Neda and I compared how long our reserve lights had been blinking for and we pulled the clutch levers in on every downhill stretch. By the time we found a gas station, our odometers read 240kms. We put in almost 8L of fuel each at the gas station! We're going to have to be more diligent about fueling up especially in the rural areas. 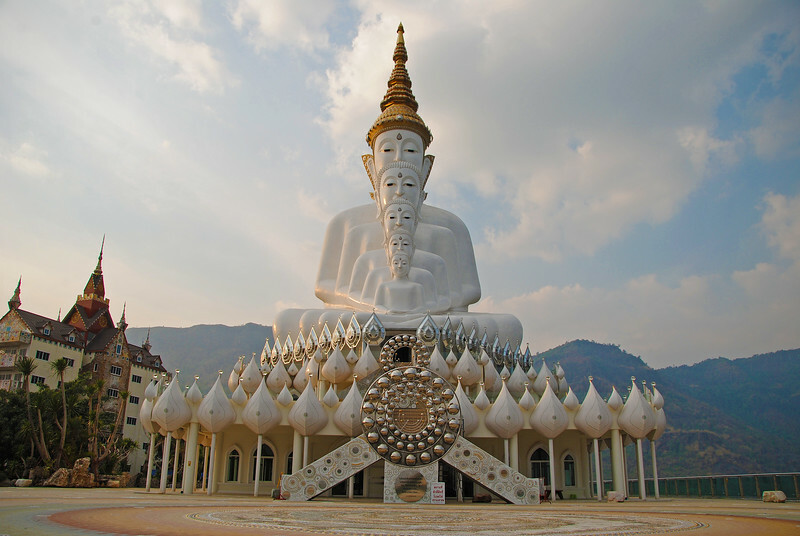 We've visited a lot of temples in Thailand and Laos thus far, and it's easy to get a bit jaded after seeing so many. 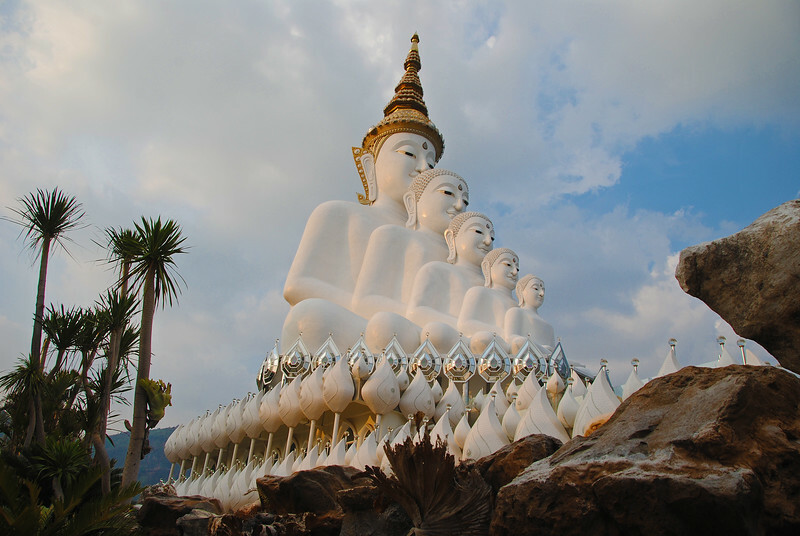 But when we pulled into Wat Pha Sorn Kaew, we were blown away by the scale of the Five Buddhas sitting cross-legged up on that high peak with the mountains of the National Park all around it. They look like those Russian Matryoshka dolls that sit one inside of another. 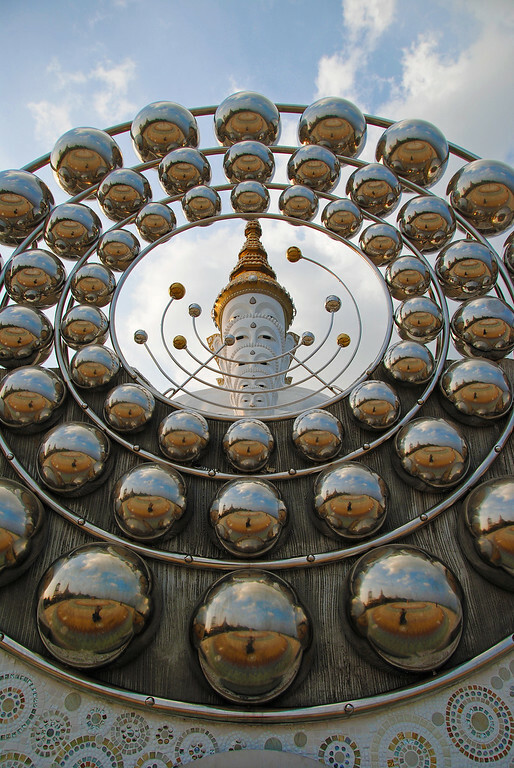 These Buddhas represented five different stages of his life. 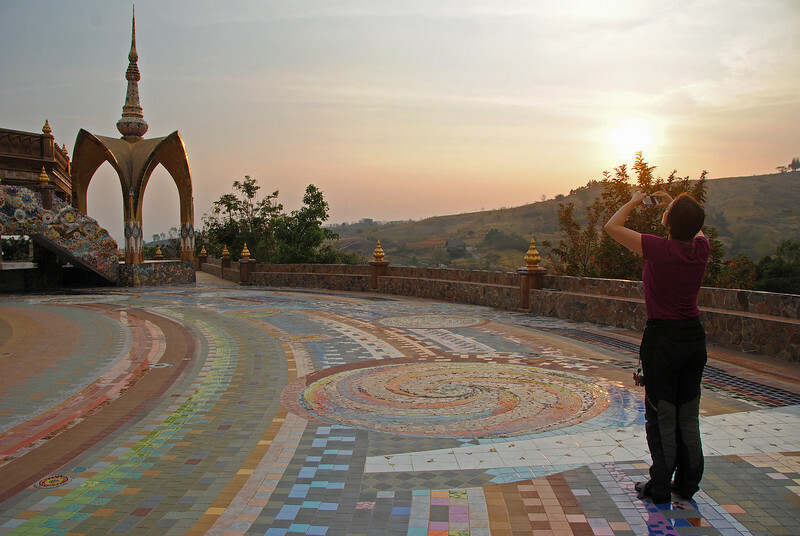 I've never heard of Wat Pha Sorn Kaew, it's not on any of the brochures or web sites, but this is easily one of the most beautiful temples that we've seen so far. Perhaps not so popular because it's so far from any large city. There's no public transportation to get here. 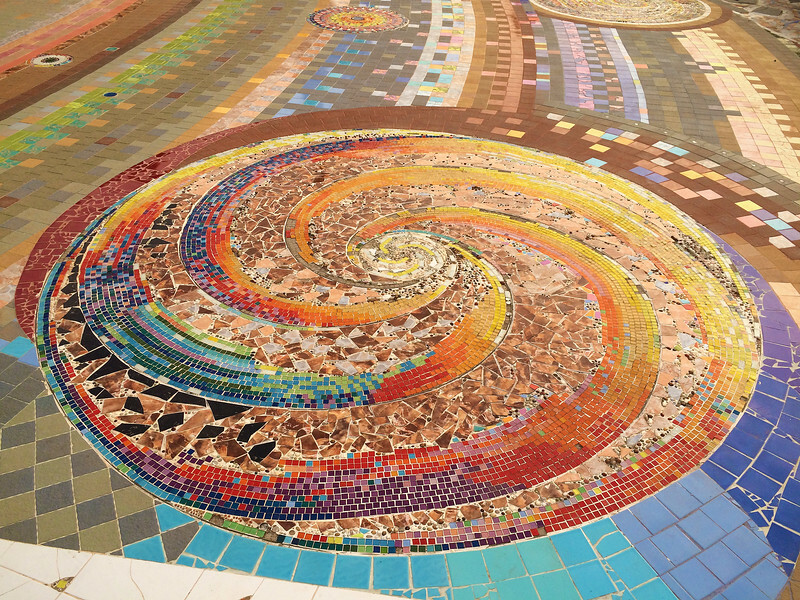 Despite arriving late in the day and competing against the rapidly setting sun, we had to take a few minutes to just sit down on the huge tiled mandala in front of the Five Buddhas just to take it all in. 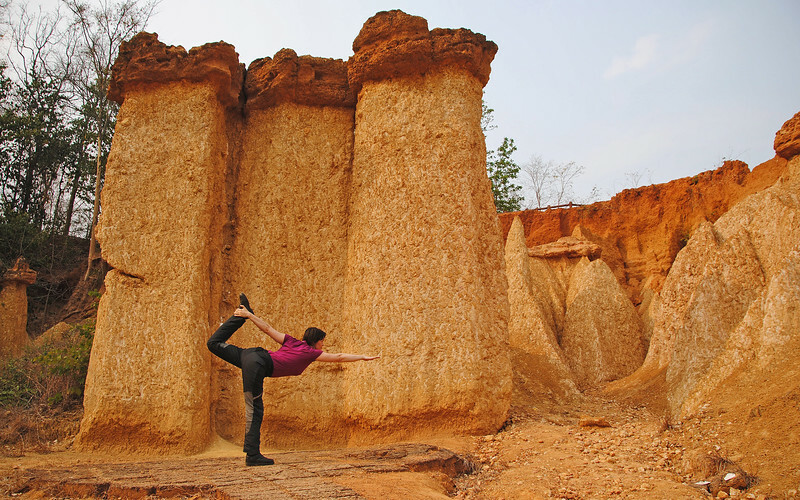 With the mountains all around us and absolutely no tourists around us, it was a perfect zen moment. 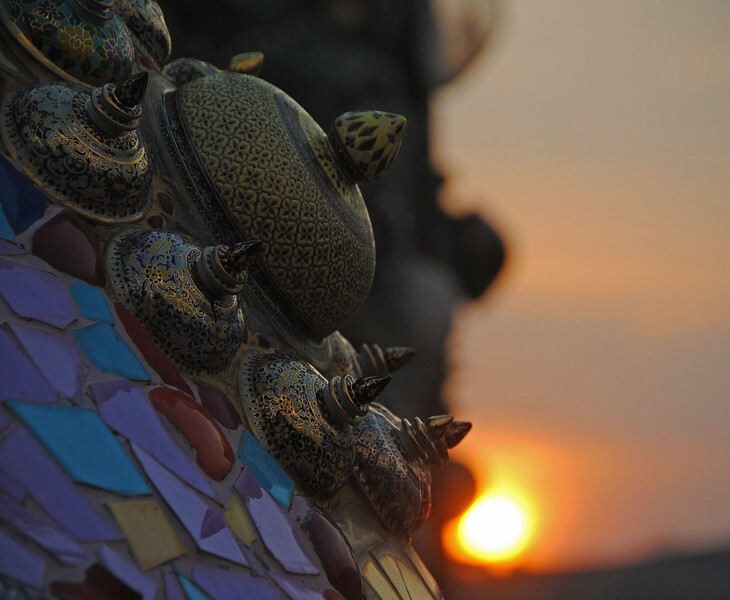 The closer you get to the equator, the sunrise and sunsets converge to deliver a perfect 12-hour day. Daylight begins at 6:00AM and finishes at 6:00PM with a variation of only a few minutes regardless of what time of year it is. 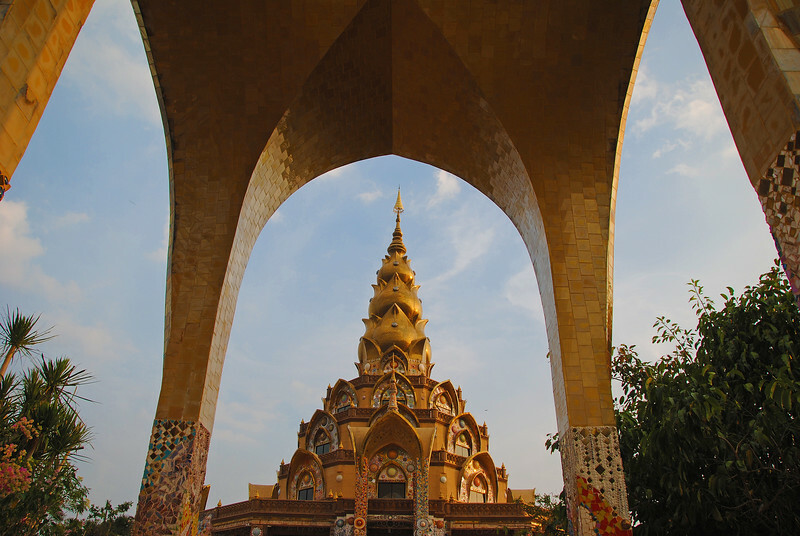 It's fortuitous that we arrived at Wat Pha Sorn Kaew right at sunset because we've got some astounding views of the temple in the golden hour. But moving ahead, we've resolved to waking up early and starting our riding day sooner. which means we'll be making more use of the 12 hours of daylight we have. Plus it won't be as stinkin' hot in the mornings as well.